For centuries humans have grown more food than they can immediately consume and so this excess requires storage for a period before consumption. Stored grain, dried fruit, milled cereals and the like, have always been vulnerable to attack from insects and the control of these insects is important however this can be difficult because sometimes these pests live inside the food product they attack so understanding the habits and life cycle of these stored product pests is crucial. Stored product pests (sometimes referred to as pantry pests or food pests) can be a health hazard in both domestic and commercial situations. They can cause enormous economic losses through damage and contamination of foodstuffs as well, contaminated food is unsafe for human consumption and hence a health hazard. As with all pests, stored product pests are not discriminatory . . . they will attack businesses, homes and agricultural food storage areas and anywhere else their favourite types of food are present so it’s wise to have an ongoing pest management program in place along with good sanitation and correct food storage techniques. Keep in mind that these pests will infest a product anywhere from production until it arrives at your home and we find this to be the case quite often when a shop, wholesaler, food processor etc passes food stuffs along to their customer without knowing that the food or its packaging may contain stored product pest eggs. Damage to grain products from larval feeding which may occur outside or inside a kernel. There’s a large variety of stored product pests but here we’ll only focus on those commonly found in WA businesses and homes. Breeding pattern: Life cycle 1 – 3 months. Females lay eggs amongst grain the larvae then bore into the kernels. Laying up to 200 eggs, the female passes from grain to grain spinning a silk thread as it moves and this can be seen as webbing on and around grain. Resultant larvae will then eat the grain and pupate in a cocoon that will be found in cracks and crevices. 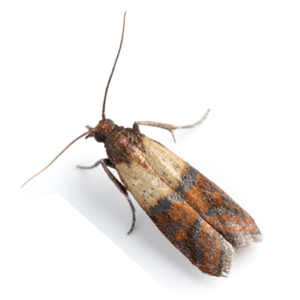 An extremely common pest found in pantries in WA homes, the Indian Meal Moth will feed on dried fruits, biscuits, cereals, powdered milk and other common household foodstuffs. These moths are extremely persistent. Because their life cycle is a rapid one, a few moths present can suddenly turn into a full blown infestation. Eradicating the visible moths will only give a temporary fix as larvae will be present in cracks and crevices and will quickly progress to adulthood so a thorough, well planned treatment for this tenacious pantry pest is what’s required and what is the hallmark of the service you’ll receive from Perth Pest Control. 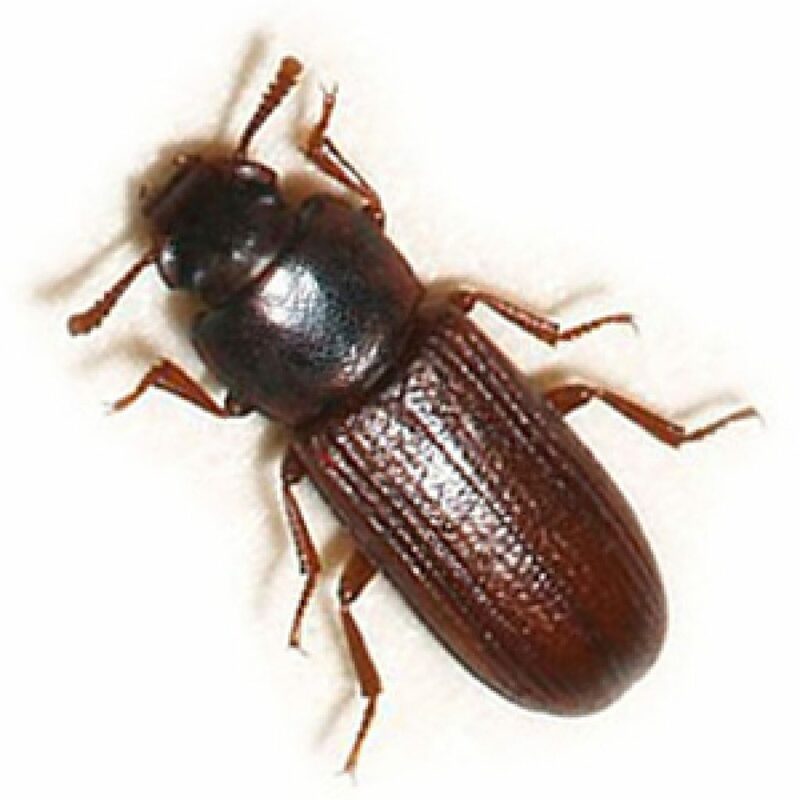 This beetle can be a huge problem on a commercial scale. They are primarily feeders of tobacco however they will also feed on milled cereal, stored grain and even spices and curry powder. 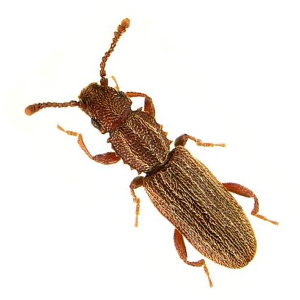 These humpback looking beetles will devour the complete grain starting from the outside and working inwards and they infect the widest range of foods of any stored product pest. Breeding: life cycle of 3 – 6 weeks. Females lay up to 300 eggs amongst broken grain and other food. 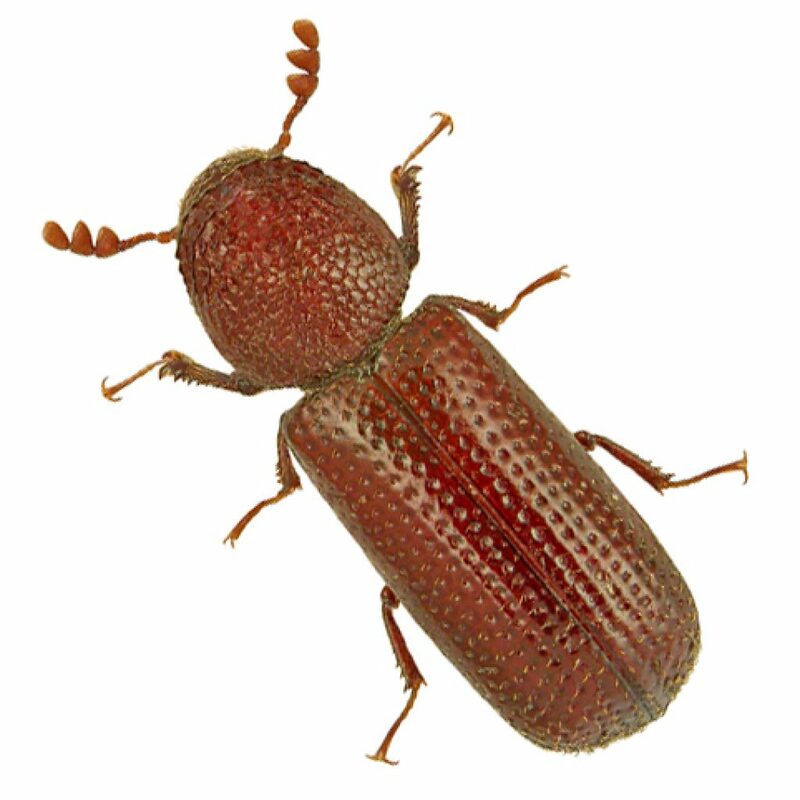 The Saw Toothed Grain Beetle is defined by ‘saw toothed’ like projections on either side of its thorax and is a pest quite often seen on WA farms. Generally it can’t feed on large particles or whole grain but will tend to nibble on broken kernels or will even follow up after other food storage pests. They are commonly seen in grain bins, wheat silos as well as kitchen pantries. Breeding: life cycle of 2 – 6 months. Eggs are usually found in crevices or under the surface of loose food and hatch in about one week. 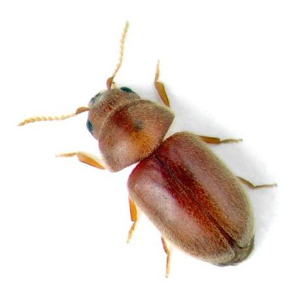 The Warehouse Beetle has the unusual characteristic of actually slowing their development and extending their larval life if environmental conditions are poor or food sources are scarce. They do this by shedding their larval skins and in fact the presence of an accumulation of these skins is an indication of a Warehouse Beetle infestation. This pantry pest is a relatively new one and in fact is an introduced species that was only found in WA in 1989. 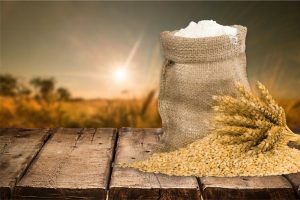 It is a major pest for stored grain and can be found in a whole variety of locations such as seeds, grains and packaged foods as well as dog biscuits, old rodent baits and even bee and wasp nests and animal droppings. It’s important to note that the hairs shed by the Warehouse Beetle larvae may cause asthma, skin problems or gastric disorders. 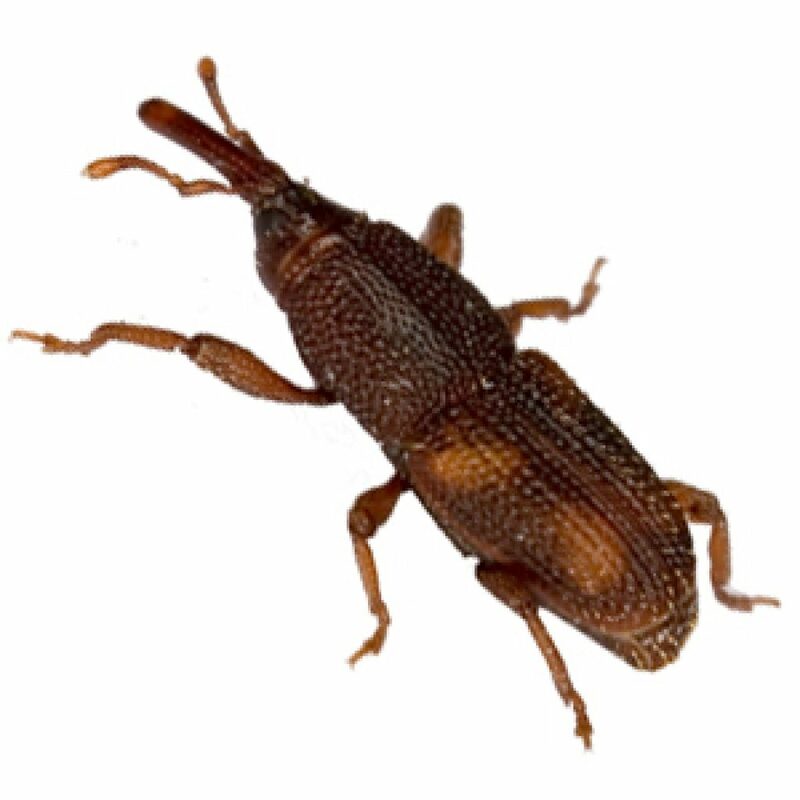 This species of pantry pest actually has two quite similar members – the Rice Weevil (Sitiphilus oryzae) and the Granary Weevil (Sitiphilus granaries). Size: both adult species are 2.5 – 4mm long and their respective larvae grow to approximately 4mm in length. 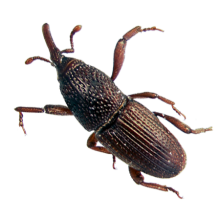 Breeding: life cycles of these weevils will be 4 – 6 weeks but adults can live up to 6 months. 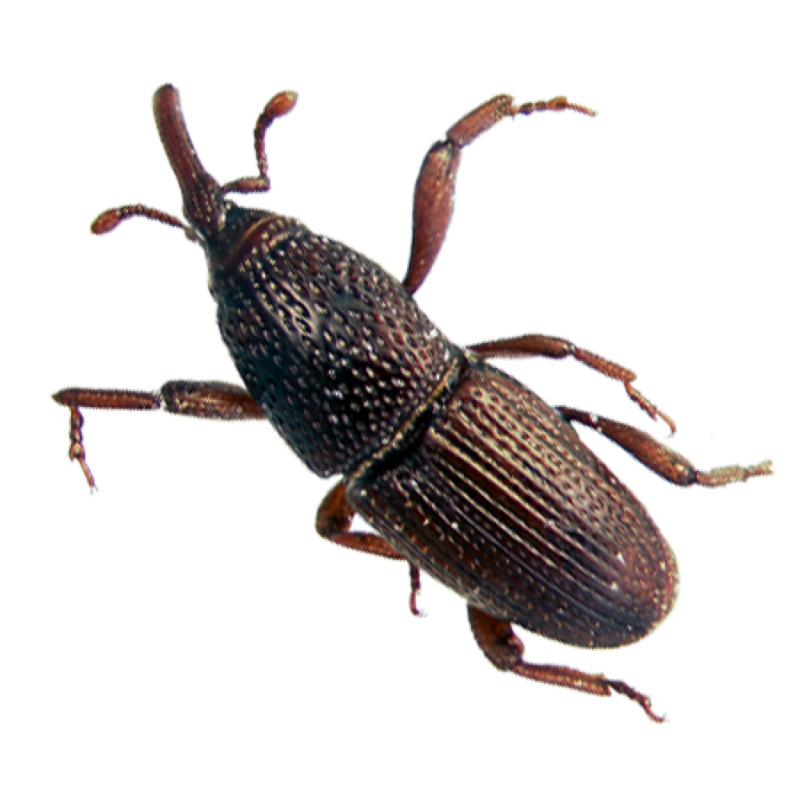 A primary pest of grain, both these weevils could be considered the most destructive pest of stored products. The female bores a hole in a grain kernel where the larvae will develop. Both the adult and larvae consume mostly grains such as wheat, rice, maize, barley and oats but will occasionally attack other stored foods such as spaghetti. 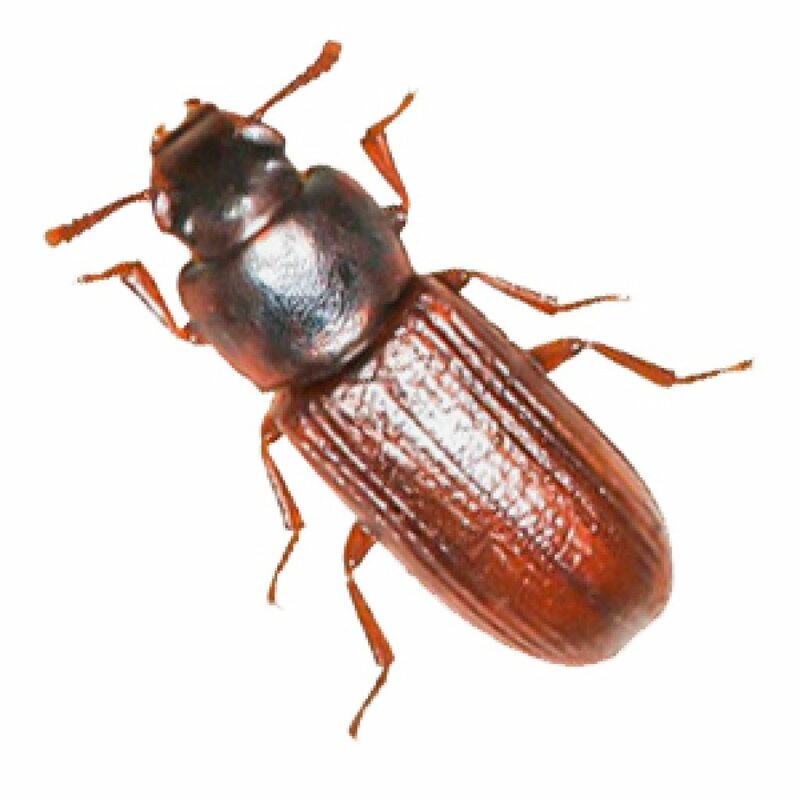 The Flour Beetles class has two commonly seen types in WA – the Rust Red Flour Beetle (Tribolium oryzae) and the Confused Flour Beetle (Tribolium confusum). 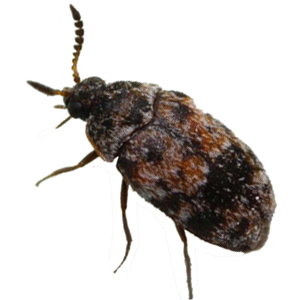 Their physical characteristics are similar and this has led to the name ‘Confused Flour Beetle’ however the main difference can be seen in their antennae with the Rust Red Beetle having a distinct 3 segmented club at the tip whilst the Confused Flour Beetle has an indistinct 5 or 6 segmented antenna. Breeding: life cycles of both these beetles are 4 – 8 weeks. Females lay up to 400 eggs loosely among food material. The Rust Red Flour Beetle is frequently found on farms in Western Australia where it feeds on stored cereals, grains, stockfeed, seeds and even spices. The Confused Flour Beetle has a diet similar to that of its Rust Red counterpart but it’s interesting to know that neither beetle can eat whole grains and tend to consume cereal dust and broken kernels. Breeding: life cycle of these pests is 8 weeks. Females can produce up to 500 eggs at one time and these are scattered loosely in grain. 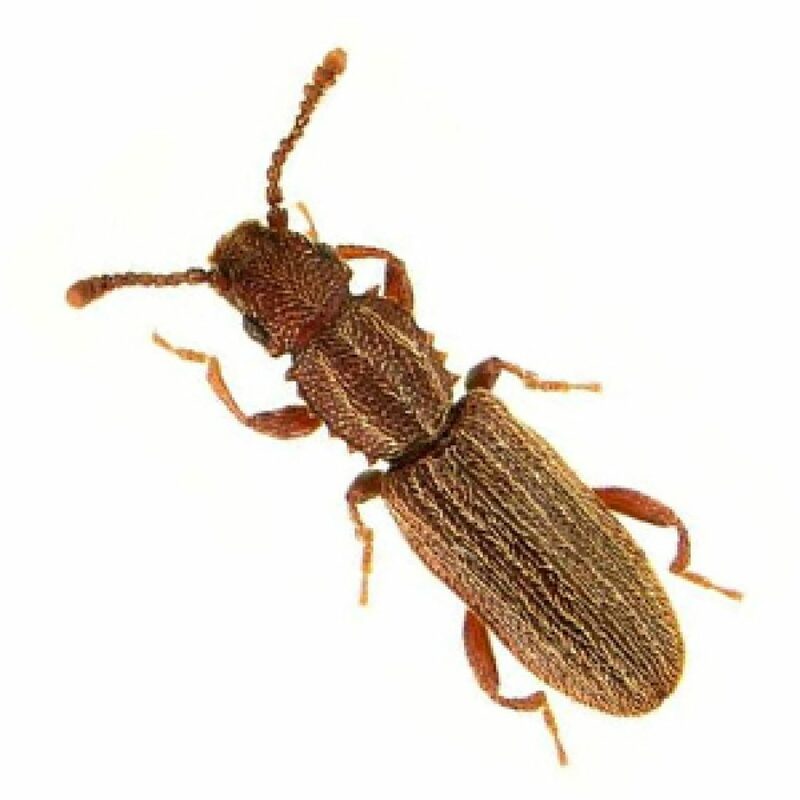 The Lesser Grain Borer is a primary pest of grain in Western Australia meaning it can bore directly into a kernel where it will consume the insides reducing it to a hollow husk where it will reside and complete its larval life. This stored product pest is probably the most serious pest of stored products in WA. It is primarily a pest of stored wheat and corn but it can also infest tobacco, nuts, birdseed, biscuits and cocoa beans as well as spices, rodent baits and even dried meats. When these pests are discovered either within stored food or in the vicinity, scrupulous cleaning is essential. Contaminated food needs to be discarded and all surfaces attended. The problem however, is a reoccurrence of these pests. They are very tenacious with eggs secreted in cracks and crevices and it’s not uncommon for an initial cleaning to have seemingly eliminated the infestation and then several days later find the pest have come back. Also, particularly in a commercial environment, it can be difficult to locate the source of the infestation. Our technicians, when called in to treat the problem of stored product pests on your premises, will do a thorough survey to locate the cause of the problem and our treatment will include the light application of surface sprays that will eliminate both the immediate infestation and stop any future outbreaks.